One aid to working for the Earth is seeing her as she truly is. We can open to the wonder around us at any time and explore with new eyes the beauty and mystery that is here waiting. It is this exciting endeavor that has captivated people since the dawn of consciousness. We can and should study the Earth in detail. But something else is needed. We need to see and understand the Earth as a whole—as a complex but integral totality. When we do, we are inspired. The image of the Earth as a whole entity instead of a collection of countries or images on flat maps has the power to change the way we feel. Until recently, this had to be done in the imagination. But with the advent of space travel, a lucky few of us have been able to see the whole Earth in a single frame of view. Satellites have allowed more of us to see it via pictures—at least in two-dimensional views. Now the three-dimensional view of the Earth is possible for all to hold and see. We sell these globes to enable more to gain this perspective. 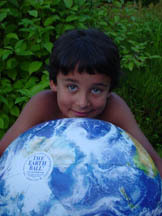 Geo Education & Research is a distributor and retailer of the Earth Ball Globes. Regular (16 inch diameter) globes retail for $15 and wholesale for $7.50 or less. 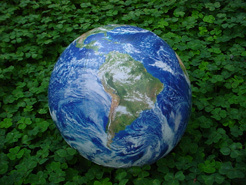 The Earth Ball is also available in a one-meter diameter version for $125 ($62.50 wholesale). Featuring the same NASA satellite imagery and ‘NightGlow Cities’, these larger versions of the original EarthBall are great for conferences, festivals, and other special events. Every 1 meter EarthBall comes with its 20 page Global Handbook, full of games, activities & resources for Earth adventurers of all ages. 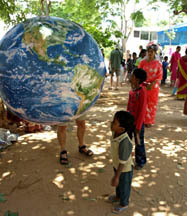 Perfect for classrooms, presentations, concerts & parades, the One meter EarthBall is a beautiful and powerful reminder of the world we all share. The Earth Ball is a 16-inch diameter inflatable globe that portrays the image of the Earth from space (from NASA satellite photos) with dots on cities that glow slightly in the dark and a handbook. The black and white Earth Ball handbook has inspiring quotes from astronauts, scientists, philosophers and poets; interesting facts, games, and exercises; and resources for further education. Can we somehow transcend our fear and mistrust of one another? Can we redirect our immense collective energies towards creating a world in balance, where all of humanity shares the same essential opportunities to be healthy, nourished, and educated? Especially, can we create a world where children have the opportunity to simply grow up and inherit a planet that is a beautiful and harmonious place to live? One of the unique aspects of the Earth Ball is that it illustrates cloud forms. Notice the directions in which the big storms rotate in different areas of the planet. Can you see how they spin clockwise in the Southern Hemisphere and counterclockwise in the Northern Hemisphere? This is due to the global air current created by the Earth’s rotation. Can you show which way the Earth rotates? Think about where you see the sun rise and set. Can you identify other cloud patterns? You can use your Earth Ball to map out routes of exploration, trade, animal migration, travel, etc. Use a water-soluble felt tip pen to draw on the ball. Be sure to test a small area to be sure that it will erase. Try using different colors to symbolize various animals, historical periods or whatever you are mapping. You can create a three-dimensional visual aid for your next history or science report. Do you wish that your Earth Ball had names on it so that you could find where places are? Try placing adhesive dots on the places you want to identify. They can be numbered to correspond with a printed key of the place names. A conventional globe or world map will help to locate them. Colored dots can be used to key different types of places such as cities, mountains, deserts, and oceans. Here is a fun activity that will help you orient yourself to other places on the planet. From where you stand, can you point directly towards Europe or Australia? Use the Earth Ball to help find them. Hold the ball so that your present location on it faces up and it is aligned with true north. Then, locate Australia on the ball and notice where it is in relation to yourself. From North America, you will see that it is almost directly below your feet! Europe would be east and down about 45 degrees below the horizon. You will discover that the straight line to any distant location around the globe from yourself is down, through the Earth. With a little practice, can you point directly to each of the continents? Your friends will be amazed to learn where they really are. The scales printed on the inside front and back cover of this booklet will enable you to measure miles and kilometers between locations on the Earth Ball You can make another scale yourself that shows how far one can travel by jetliner in a given amount of time. A jetliner flies about 550 miles or 885 kilometers per hour. How far from the South Pole are you and how long would it take to fly there? How many hours would it take to fly around the world at the Equator if you didn’t have to stop to refuel? The six seams around your Earth Ball represent six major lines of longitude on the Earth: 30, 90, and 150 degrees East, and 30, 90, and 150 degrees West. To identify these, first, locate the seam that runs through the Atlantic Ocean. This is the 30-degree West longitude line. The seam through Africa is the 30 degree East line. Midway between these two seams runs the 0-degree line, which is also known as the Prime Meridian. Halfway around the world from the Prime Meridian, midway between the 150 degrees West and 150 degrees East seams, runs the 180-degree longitude line, also known as the International Date Line. Can you find it? The Earth Ball will also function as a time clock to indicate what time it is anywhere. As you know, it takes 24 hours for our planet to complete one revolution. Since the seams divide the ball into six equal panels, the east-west distance across each panel represents four hours. To determine the present time at any location around the world, simply add four hours to your local time for each panel you cross heading east, and subtract four hours for each panel you cross heading west. To calculate smaller distances, divide each panel into four one-hour segments. Did you notice that the further you are from the Equator the less east-west distance it takes to traverse time zones?